Tea House is an “After Day” (short term) paying program which was started on 23rd Of December 2016 and added to AlexNews on 4th Of January 2017. It was listed on Basic Listing section from the first but they have upgraded their listing to the Sticky Listing on 13th Of February 2017. They also have added more monitors from 13th February and as I think they’ll done more advertising soon. As you know, “After Day” programs always start with good advertising campaign. But Tea House was started with small promotional activities and was paying silently. Today, they have aged 62 days and look like a reliable program. It was the right time to start their promotional activities and the response of investors is also noticeable. Specially, from last 2 days I’ve seen a lot of investors were joined Tea House and many of them were big investors. I think it will become more popular in coming days. Tea House was started with a basic design but has changed their design recently. The current design is very charming and creation of professional designers. All of their links and menus are working fine and every page has something different to show. I’ve not found any faults in their website and as I told it has the professional touch on every page. Communication is an important part of short term HYIPs and Tea House has a very good communication system. Their live chat person is very responsive and I found them online always. They have the phone support also but the call was not answered by a real person (yeah! I called there). They are also active on social media and have a channel on youtube (currently no videos available). The news page is also very active. The total on site presentation is impressive. Investment plans are always the most important part for an “After Day” program and Tea House offering – 102.5% & 120% after 1 day, 114% to 220% after 5 days and up to 5000% (!) after 70 days. Surprisingly, there are no other sub-plans between 102.5% and 120% after 1 day. The minimum investment is started from $10 and all popular payment processors (PerfectMoney, BitCoin, Payeer, Advcash & Nixmoney) are accepted to make investment there. After 1 day plan is always the most popular plan in any “After Day” program. Tea House is paying 102.5% after 1 day for investing from $10 to $500. No other plans for $501 to $20000. It’s look like that there were other “After 1 day” plans also but program owner has disappeared those temporarily/permanently. However, 102.5% after 1 day is still an attractive and a fair ROI in HYIP industry. 120% is out of reach as it required the minimum of $20001 to start with. 114% after 5 is also ‘OK’ for small and medium amounts but I strongly suggest to not to invest in other plans. Also, if you are not so expert in HYIPs then do not reinvest in same programs. Build materials of Tea House are noticeable. Member area is based on GoldCoders script, Hosting and DDoS protection from Koddos. 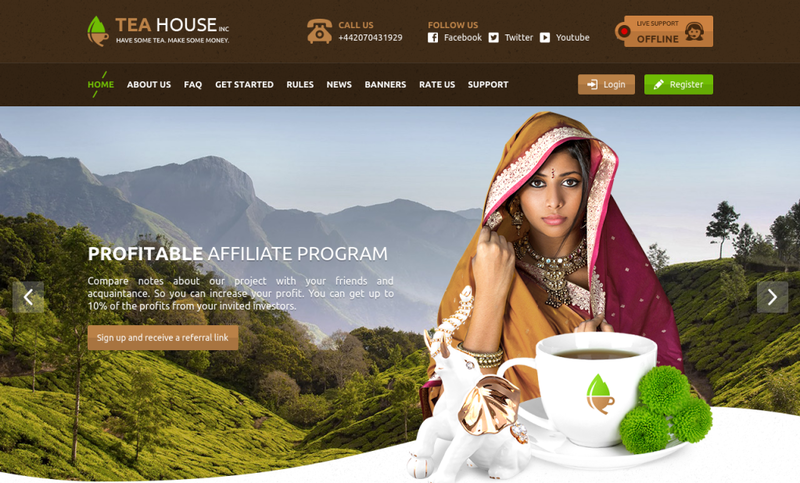 Tea House is registered as a private company in UK. Their extended validate SSL provides the identity of company and also provides the secure connection between the server and the user. In a word, every of those elements are top class and used to build qualitative HYIPs. Finally, the creator/s of Tea House was always serious about their program and also they look very professional in this field. They have spent enough to build their program and for promotional activities. Tea House has collect a lot of investors already and able to run for a long time. Still, short term programs need an acceptable amount of investors on daily basis. It will be a wise decision to invest in this program when the flow of investors is stable. So, right now it’s a suitable time to invest here but please don’t more than you afford to lose.